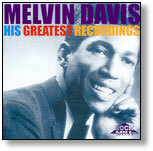 HAYLEY RECORDS is proud to distribute a profile of one of Detroit’s finest talents – MELVIN DAVIS. This comprehensive collection showcases his incredible talent as singer, writer, producer and musician from his earliest recordings in the 1960s until the present day. The mega rare “Find a quiet place”, crowd pleaser “I must love you” and his version of “Chains of love” are all here plus previously unreleased Davis compositions for other artists like “I’m the one who loves you” and “I need my baby”. The Mala and Invictus recordings are here too, and feature his tenure as lead singer of the 8th Day on the hits “You’ve got to crawl”, “Eeny meeny miny mo” and the beautiful “You made me over”. Davis’ own Rock Mill label contributes six songs in total, including his own version of “Thinking of you”, now available for the first time, and the sublime “Double or nothing”. 19 tracks of top quality soul, spanning the decades and telling it like it is! Take a listen. Hayley Records invites you to sample some of the 19 previously unreleased recordings available on this Album.